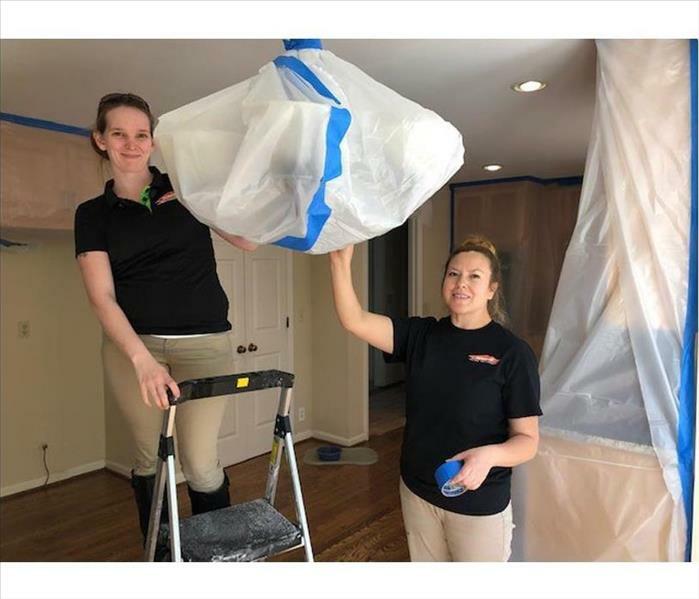 Several of our SERVPRO Ladies are putting the finishing touches to a containment project in a Brentwood home. Whether protecting fixtures and furnishings from a fire, mold, or water damaging mishap, they get it done with a smile. Plastic sheets and blue painters tape mixed in with some TLC protects our customers' contents. 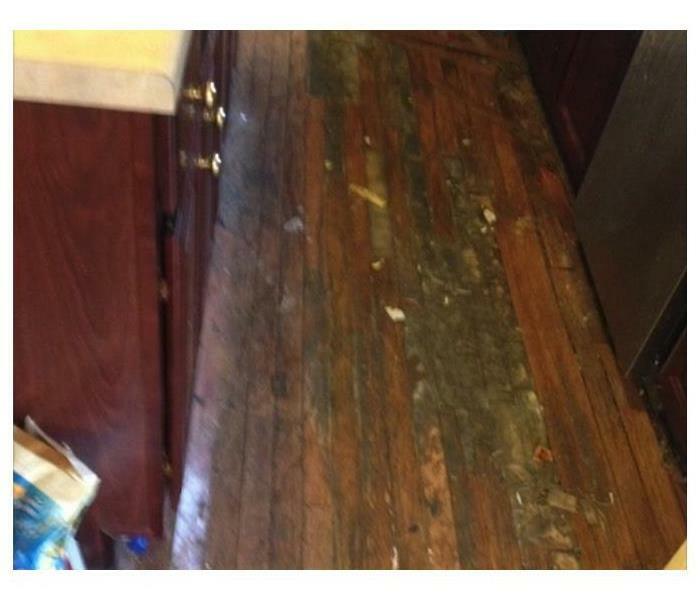 Just another reason Why SERVPRO is the company of choice for cleanup and restoration. 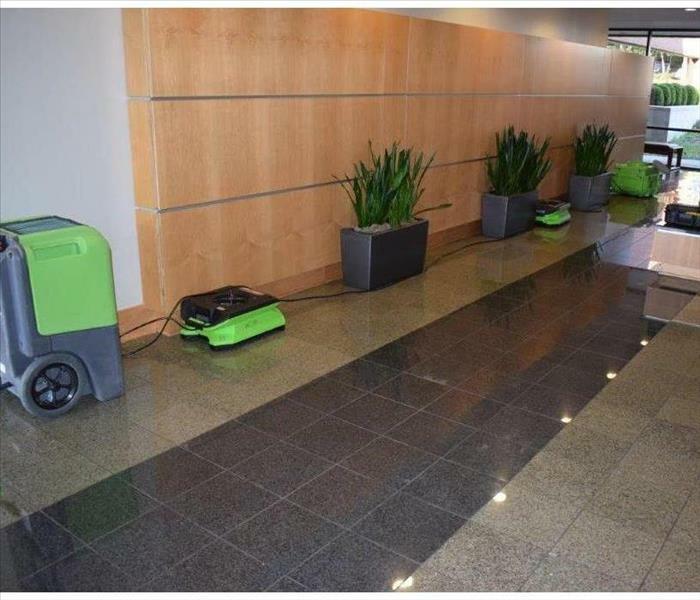 When the Maryland Farm Building signaled to us they had a water leak flooding the entrance way, our SERVPRO team responded promptly. After all, We're Faster To Any Size Disaster. Advanced equipment like an LGR Low-Grain Refrigerant dehumidifier and air movers complete the drying of the affected area. 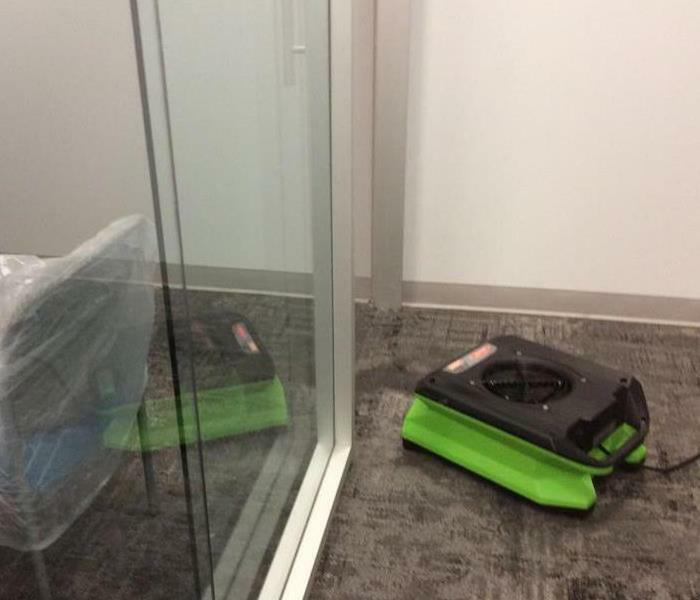 Our team started the service with squeegees, not so high-tech, but it mitigated the water damage, and we left with the commercial building appearing "Like it never even happened." SERVPRO crew removed the water and set up air movers and dehumidifiers to dry out the structure. Ironically, we often follow closely behind our First Responders to remove water from commercial and residential properties after the fire extinguishing efforts. 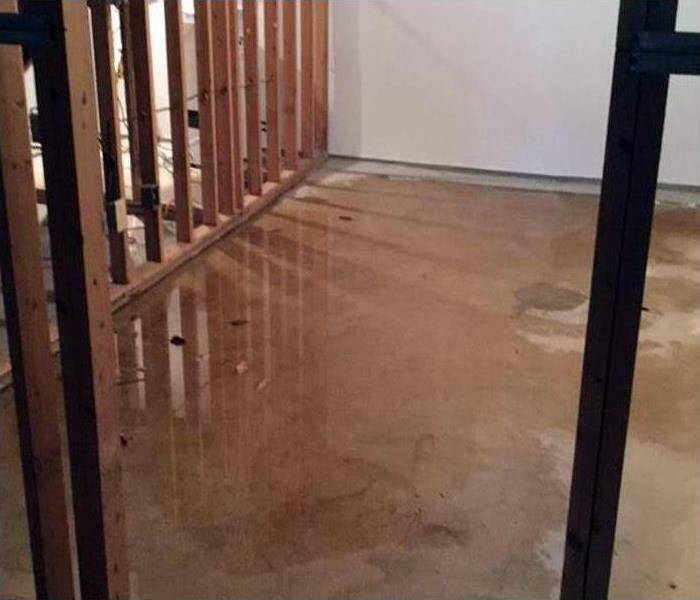 If water has taken over your home, you need the team at SERVPRO! We will respond quickly and start our restoration process right away. SERVPRO of Williamson County has the experience, specialized equipment, and advanced training to restore your home to pre-damage condition. SERVPRO of Williamson County arrived to this home that had a lot of water damage. We had to make high flood cuts due to the amount of time the water was in the home. We made sure to treat the area thoroughly to prevent secondary damage. What to do if you have soot and smoke damage in your home? If you have a small fire in your home, you might experience soot and smoke damage throughout your home. If that happens, contact SERVPRO of Williamson County to help get your home clean and restored as soon as possible. What is the best course of action to take if you have a fire in your home? If you have a fire in your home, it is critical to get a restoration company on site immediately. SERVPRO of Williamson County has the team and experience to help get your home clean and restored as quickly as possible. 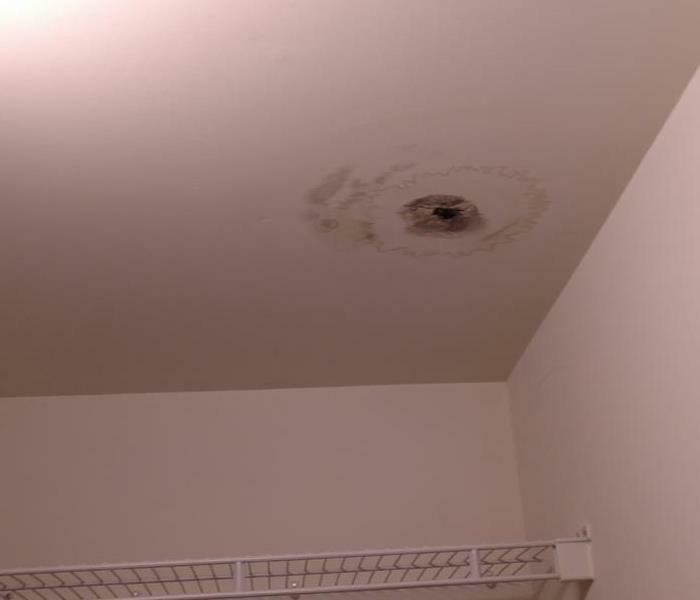 What if mold is growing on my ceiling? 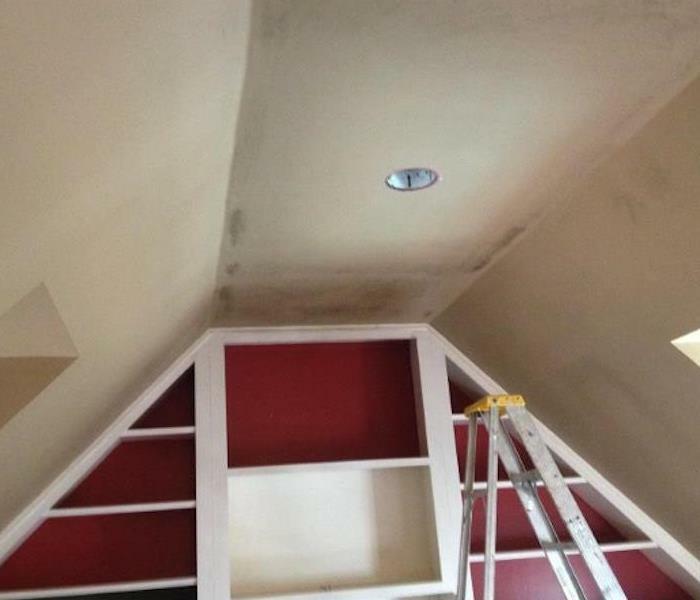 If you find mold growing on your ceiling in your home, it is important to get SERVPRO of Williamson County on site as soon as possible. They will determine what is needed to get it removed and the structure that is damaged replaced. How to remove mold if found in your home? If you find mold in your home it is important to get a licensed restoration company on site immediately. to help get it remediated. Once on site they can determine what is the best course of action to get it clean and put back in place. SERVPRO of Williamson County responded to this home that had heavy water damage from a recent storm. 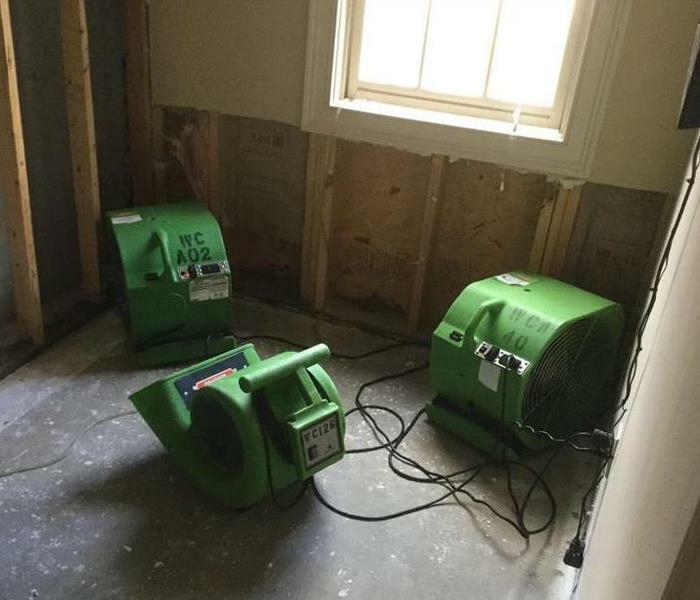 Our team quickly extracted all of the standing water and placed plenty of green drying equipment inside the home. This home had significant water damage after a heavy storm came through the Brentwood area. SERVPRO of Williamson County was quick to respond and begin the extraction process. 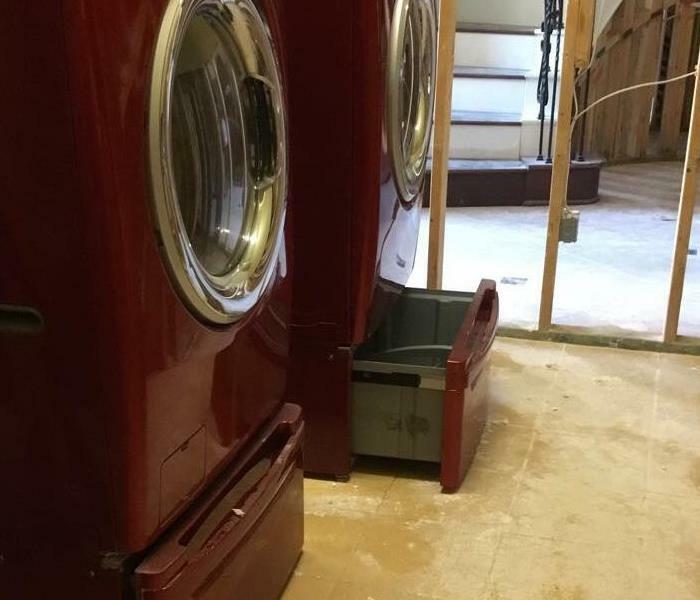 After all of the water was removed, SERVPRO placed drying equipment and monitored daily until dry. This home had significant water damage and SERVPRO of Williamson County was able to come on site and get it restored as soon as possible. Our team quickly extracted water and cleaned up debris. After our equipment sat for a few days, we were able to pull and finish the final touches. 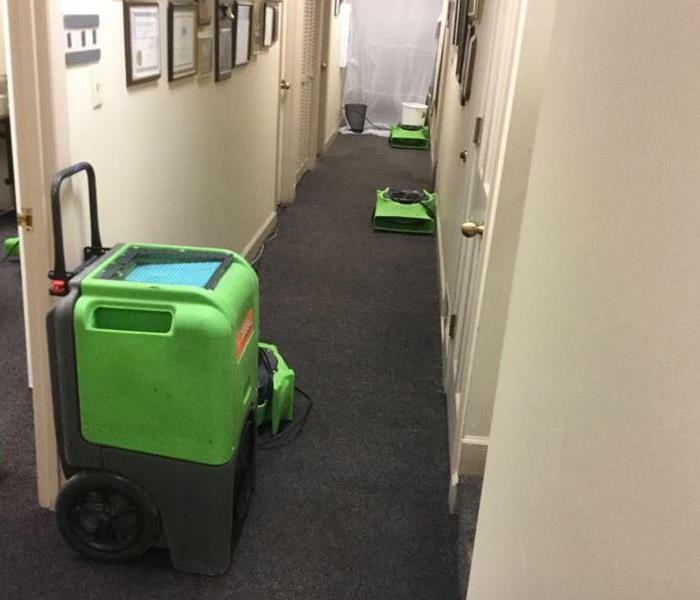 SERVPRO of Williamson County responded to this commercial water loss, Our team quickly extracted all of the water and got plenty of equipment in place to get this facility dry as soon as possible. If you have questions, feel free to reach out at anytime. This storm in Brentwood, brought in heavy rains that caused massive amounts of water damage to this home. SERVPRO of Williamson County was quick to respond and begin the mitigation process. If you have any questions, our team is available 24/7. This sunroom had extensive damage after a heavy rain storm. SERVPRO of Williamson County was quick to respond and begin the mitigation process. 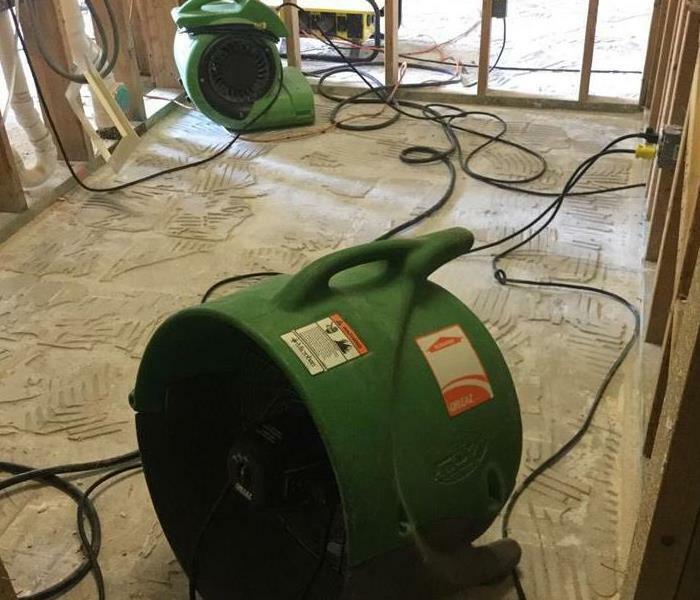 Once all of the water was dried up, SERVPRO placed drying equipment and had it ready for repairs. 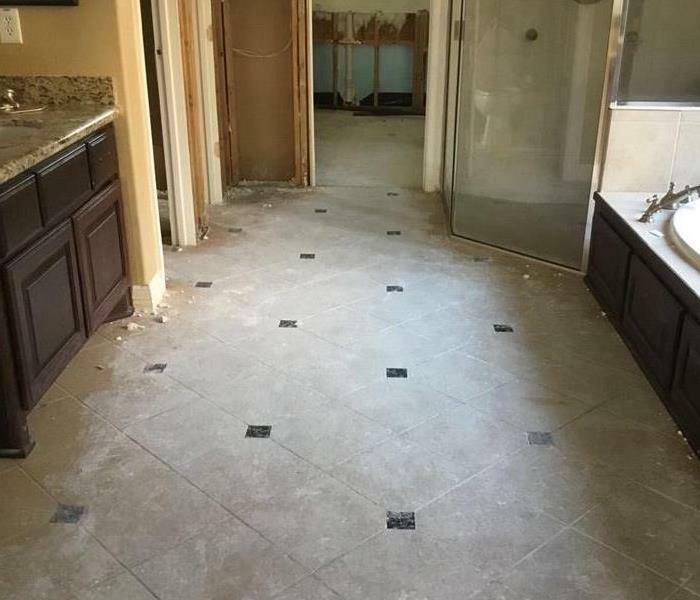 This bathroom had massive storm damages from heavy rains and flooding. SERVPRO of Williamson County was quick to respond and begin the mitigation process. Once all of the water was removed and the structure was dry, they could begin the rebuilding process. This home had mold growing all through the ceiling, SERVPRO of Williamson County was quick to respond and begin the mitigation process. Our team was able to mitigate and replace the damaged drywall in this home. This home had mold growing in the crawlspace. Many times mold will start to grow if there is a lot of moisture and not enough air flow. If you have mold growing in your home, contact SERVPRO of Williamson County immediately. 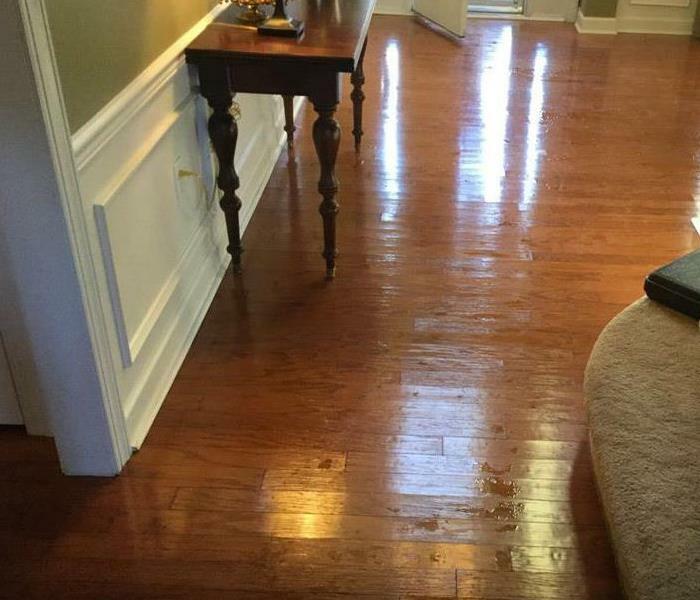 SERVPRO of Williamson County was called to help remediate the mold growing on these hardwood floors in Brentwood, TN. 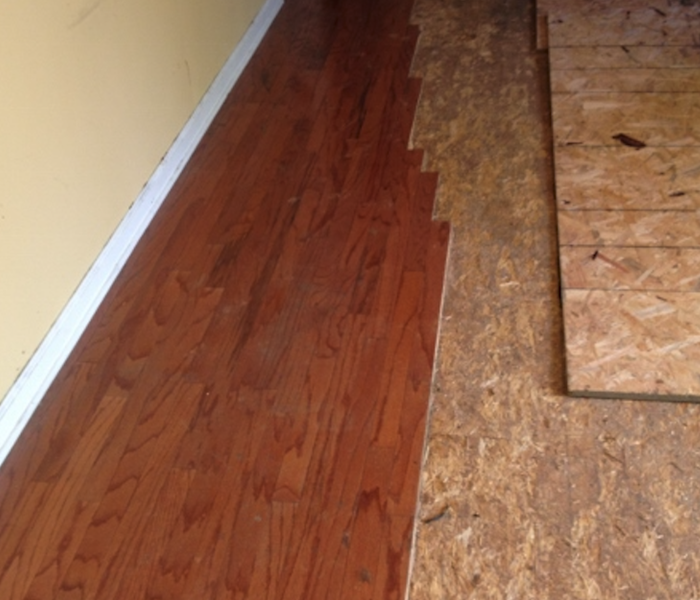 Our team carefully assessed the situation and was able to mitigate all of the mold and replace the damaged floors. At SERVPRO, we are ready for whatever happens. When storms come, we are prepared. So, if your home or business is damaged by storms, give us a call, we are faster to any size disaster. Water can seep through the slats in your hardwood floor and become trapped underneath the flooring. We use drying mats like the ones pictured here when it is possible to help extract the trapped moisture. The storage room pictured here was damaged due to a water loss. 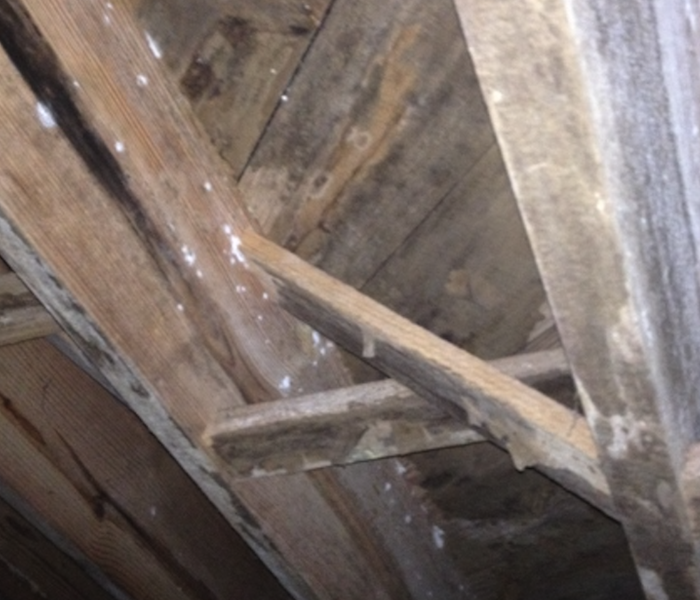 When moisture is not dealt with quickly, mold can begin to grow. 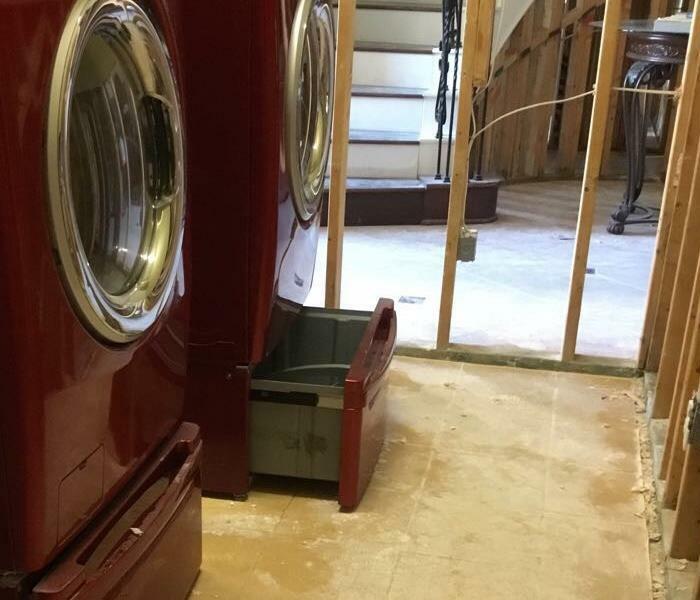 That is why we bring equipment such as what you see here in order to speed up the drying process. Our team was fast to respond to this water loss and, as you can see, we brought the necessary equipment with us to make sure that we could get it cleaned up and dried up quickly. 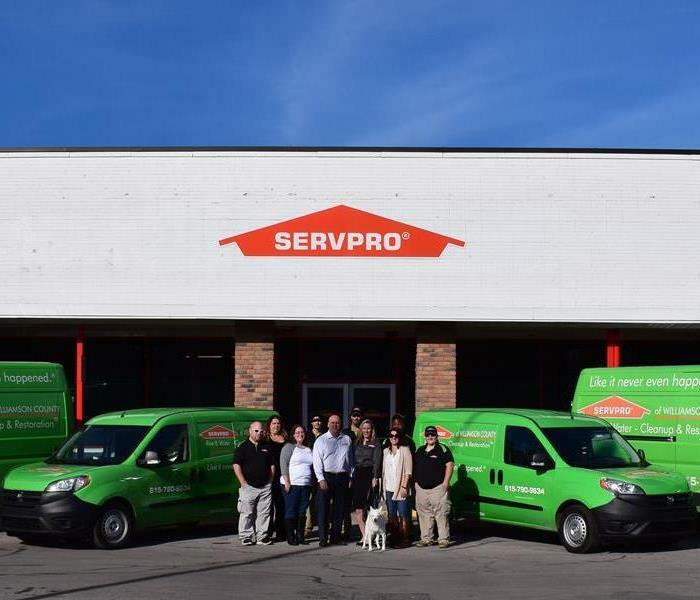 When a local realtor had a rental property with a small mold issue from a roof leak that had been fixed they knew to call SERVPRO of Williamson County. We are always here to help, large or small. A hotel had a customer over flow the whirlpool tub flooding the room and the hall in front of it. 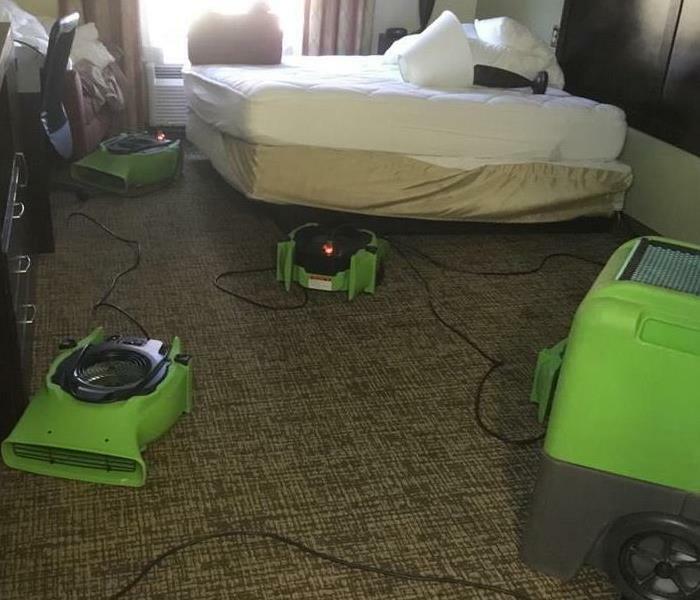 SERVPRO of Williamson County responded in the middle of the night to get them drying. 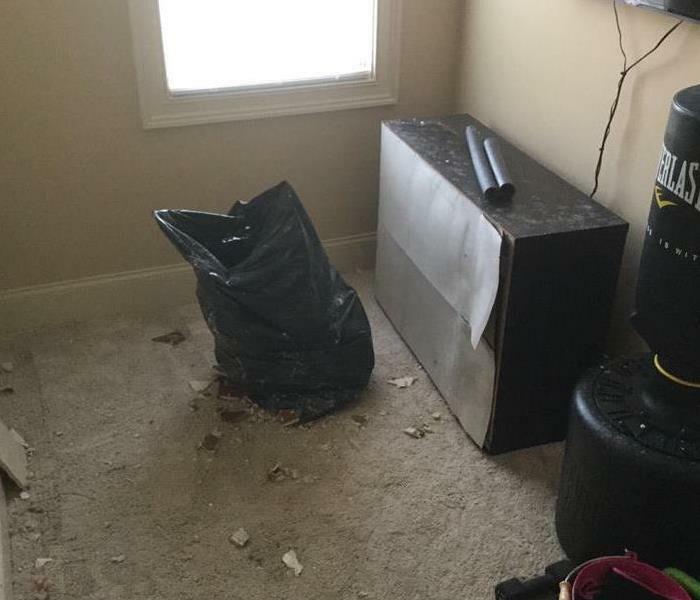 A water heater burst over night in this office in Franklin, TN. SERVPRO of Williamson County responded as soon as they called to get it dry and get them back to work. 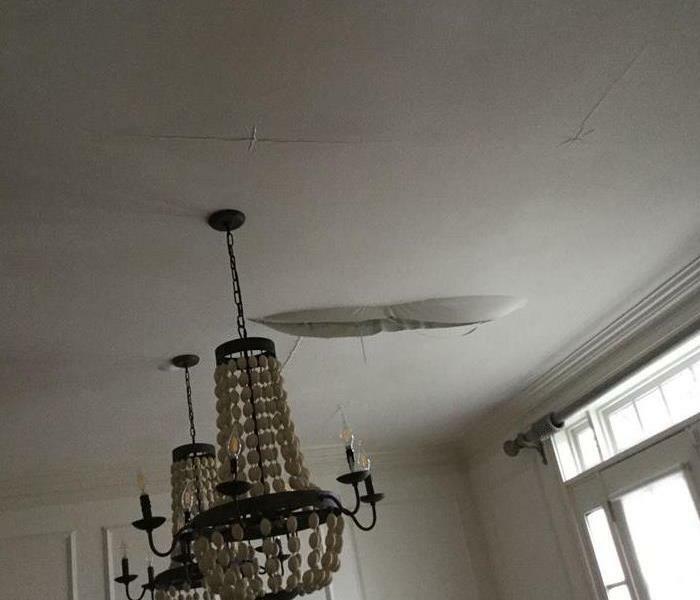 This client called us when a bathtub overflowed upstairs and it wasn't noticed until she looked up at her ceiling. SERVPRO of Williamson County is Faster to Any Size Disaster! Have water in your elevator shaft? SERVPRO of Williamson County can help. 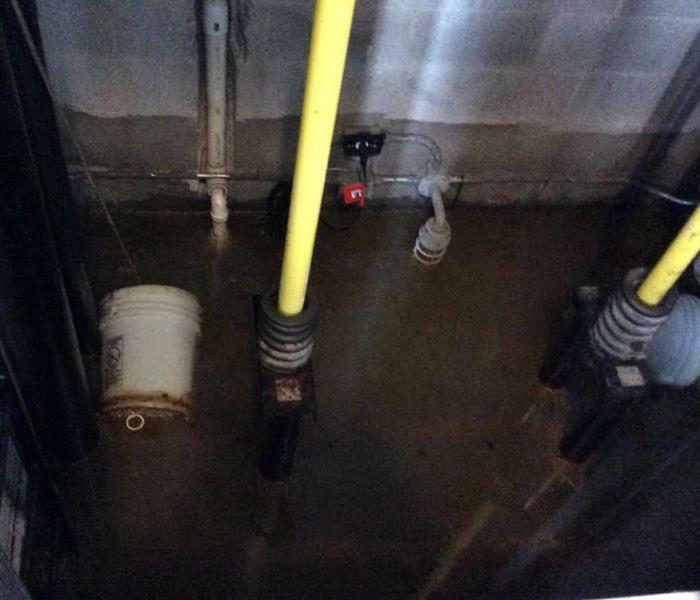 This client had a sump pump fail in their elevator shaft and luckily knew just who to call. 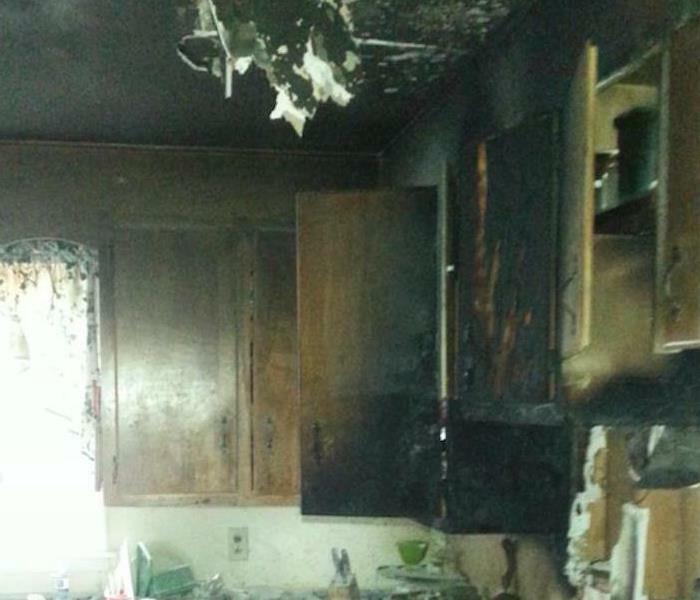 This home in Nolensville, Tennessee had a fire in the kitchen. SERVPRO of Williamson County was called to do the fire clean up and construction services to put in their new kitchen. This is all that's left of a dryer in Spring Hill, TN. Luckily no one was injured in the fire and the fire department was able to save the home. 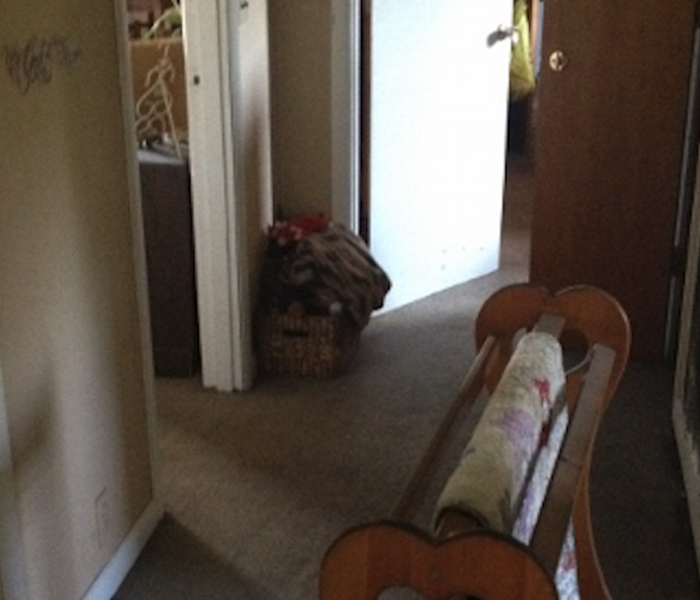 SERVPRO of Williamson County was called in to do the cleaning and restoration. 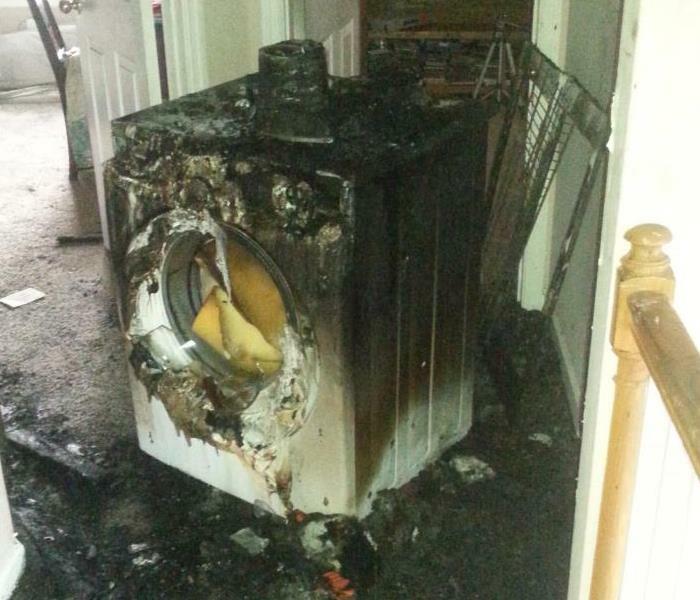 This laundry room is the result of a dryer fire starting while the home owner was home. The Spring Hill Fire Department was able to respond quickly and safe the house. SERVPRO of Williamson County was called to do the cleaning and restoration. Always make sure your lint is emptied and your dryer vent is clean. 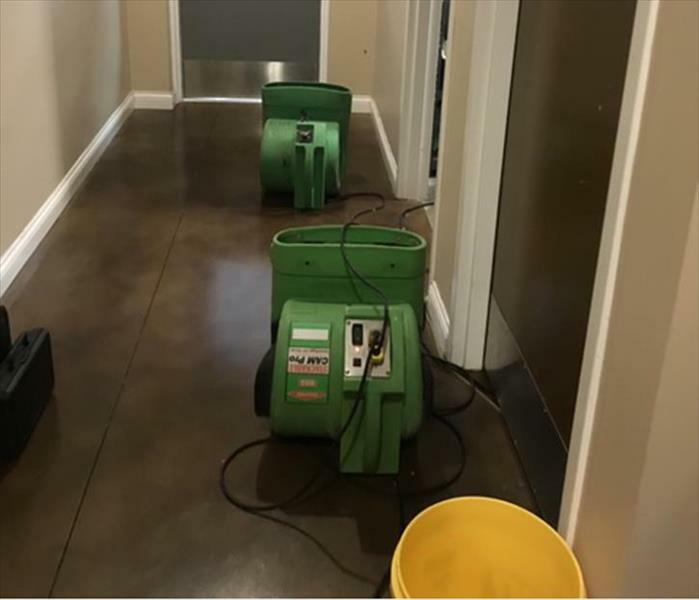 A hotel in Franklin, Tennessee had a guest overflow the sink and unfortunately it wasn't noticed until water got into the hallway. 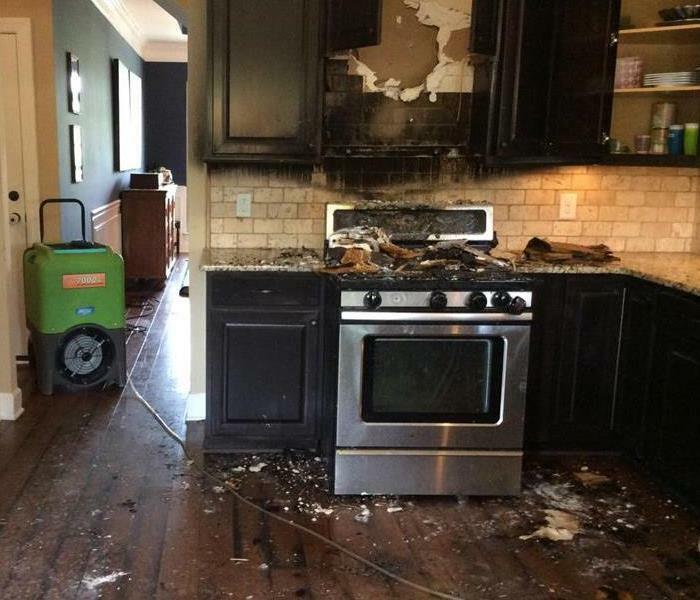 Lucky for them they knew to call SERVPRO of Williamson County. This was the aftermath of an under the sink kitchen filtration system failing. Note the standing water on the hardwood floor. Everything was normal with the client went to bed and they woke up to wet feet and their entire downstairs flooded. 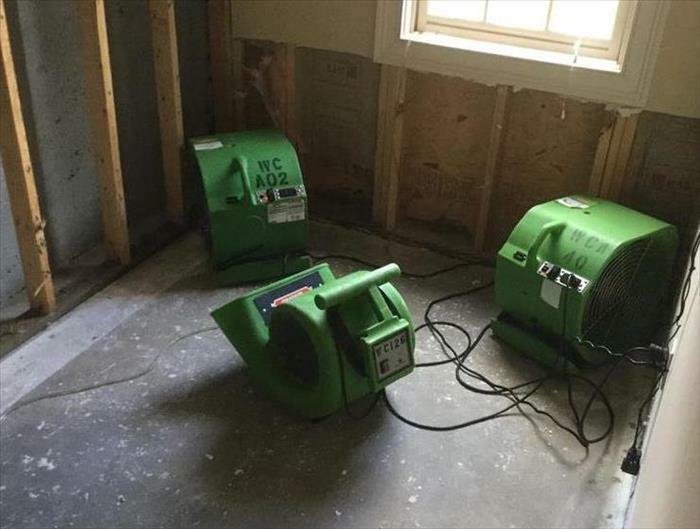 SERVPRO of Williamson County arrived quickly to begin the drying process, unfortunately the hardwood floor had sustained too much damage and had to be pulled. 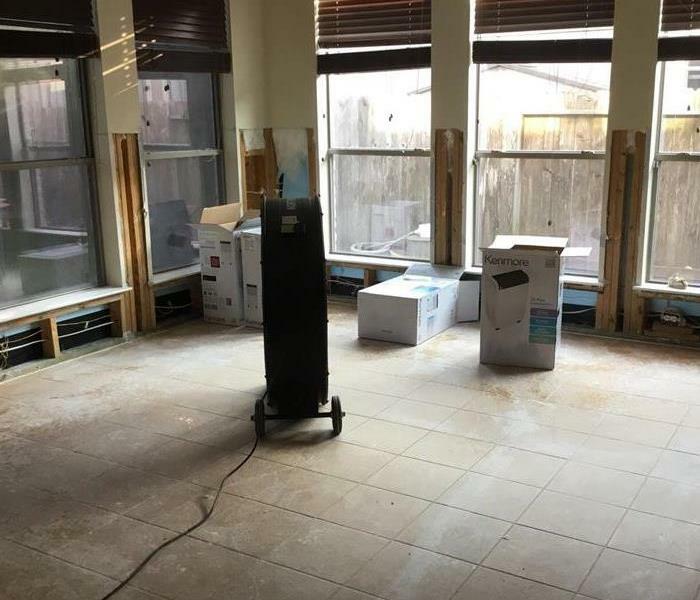 SERVPRO of Williamson County performed a professional pack out of the clients belongings to enable us to cleanly pull the existing damaged hardwood flooring so new flooring could be installed. Drying equipment was placed to ensure the sub floor was dry. This office building was almost finished when storm came through and affected an upper floor that the windows had not been installed in yet. 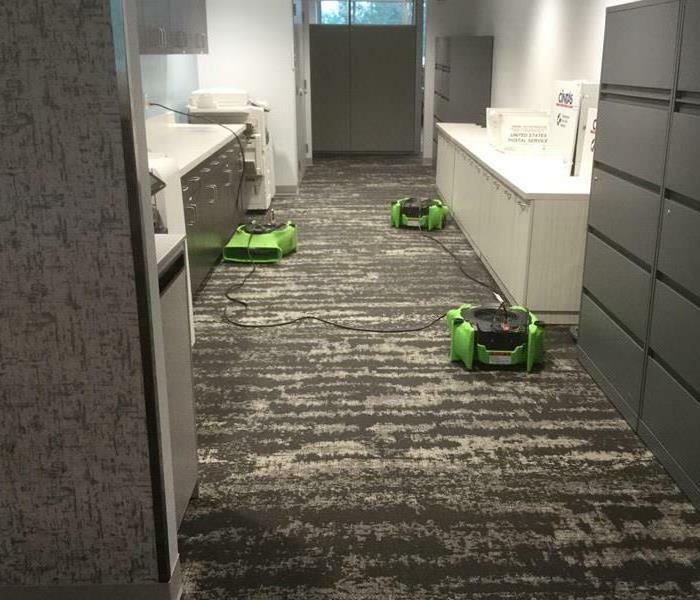 This particular client just wanted us to dry the carpet quickly. 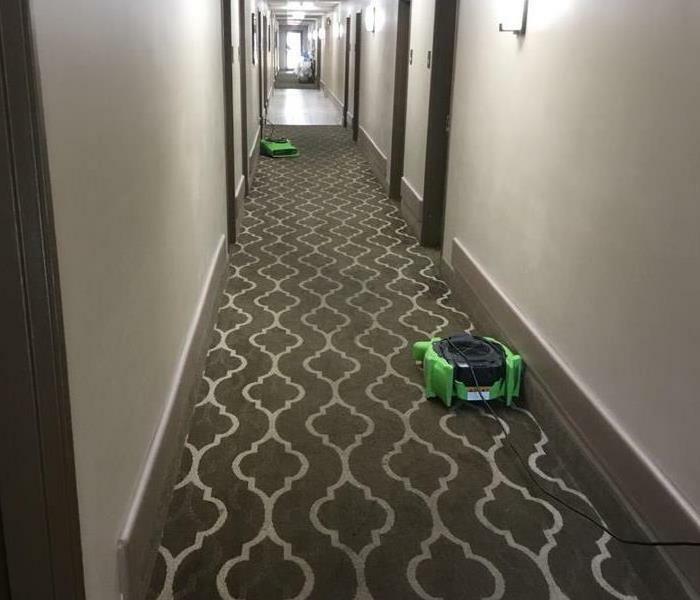 SERVPRO of Williamson County is faster to your Brentwood commercial water or fire damage. SERVPRO of Williamson County recently moved its headquarters to Historic Downtown Franklin, TN. Pictured in front of our new office is our crew. We are available 24 hours a day, 365 days a year to respond to your emergency. We offer fire and water damage cleanup and restoration as well as mold remediation and biohazard clean up. Please call us anytime at 615-790-9634. 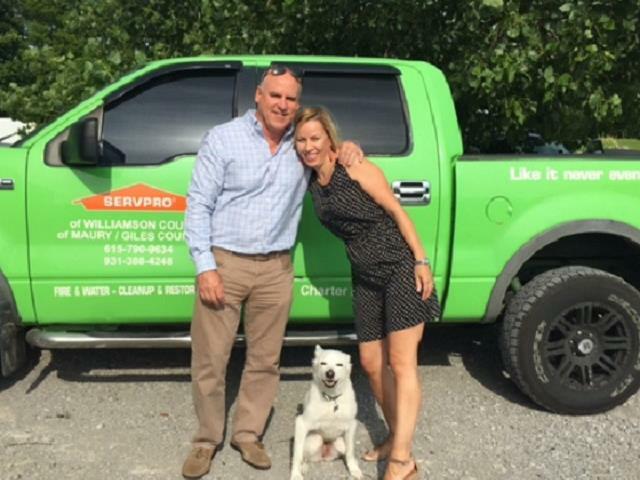 SERVPRO of Williamson County was happy to be a sponsor of this years Impcat Festival and the beautiful Rippavilla Plantation in Spring Hill, TN. This yearly event brings the community together to enjoy some live music, food trucks, a kids zone and some horse rides. SERVPRO of Williamson County brought out tent for the volunteers to use and our corn hole boards for folks to use while they enjoyed the day. Taking part in community events is important to us at SERVPRO of Williamson County - it's a rare time we don't work to make it "Like it never even happened." 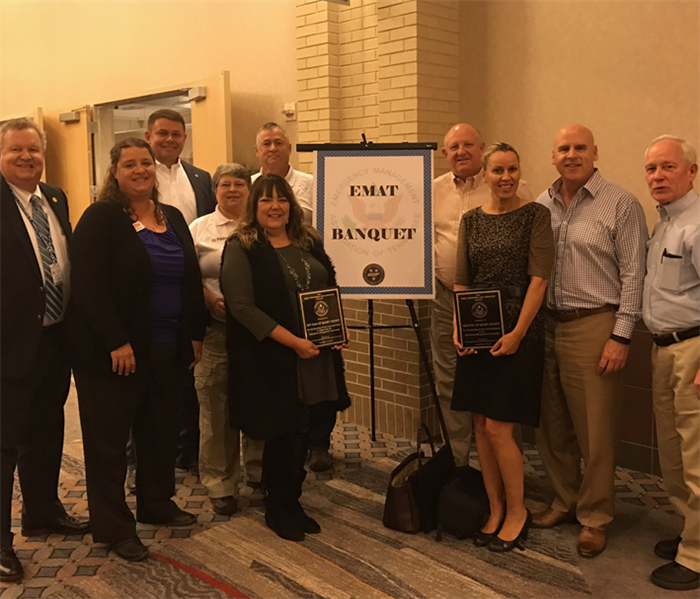 We were honored to receive the EMAT (Emergency Management Association of Tennessee) Business and Industry Award for our Pet Oxygen Mask Program which donated Pet Oxygen Masks to all of the Fire Departments in Maury County. SERVPRO of Williamson County sponsored the bounce houses at the City of Spring Hill's Night Out Against Crime on October 4, 2016. What a beautiful night supporting our city's first responders. We have expanded our fleet so that we can respond more quickly to your restoration emergency. We respond 24/7/365 to your fire, water, and mold damage cleanup needs. 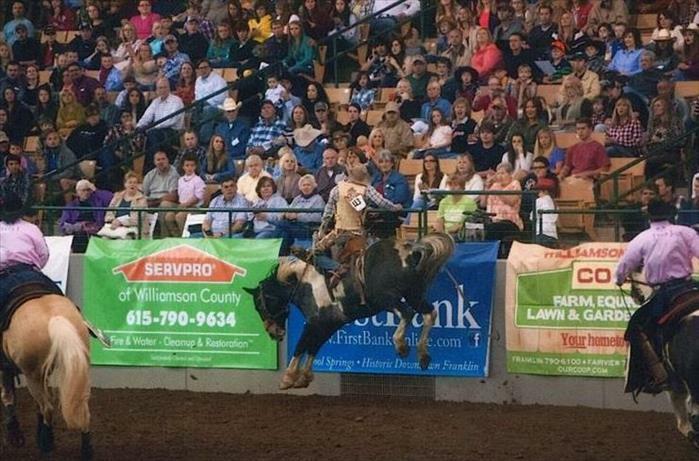 We are proud to sponsor the Franklin Rodeo each year. This event is one of the largest rodeos east of the Mississippi river and the longest running family event in Tennessee. Meet Penny, Tim and Natasha's dog. Penny typically joins us every day, but we wanted to share her with you all on National Bring Your Dog To Work Day. Dogs are more than pets, they are family. 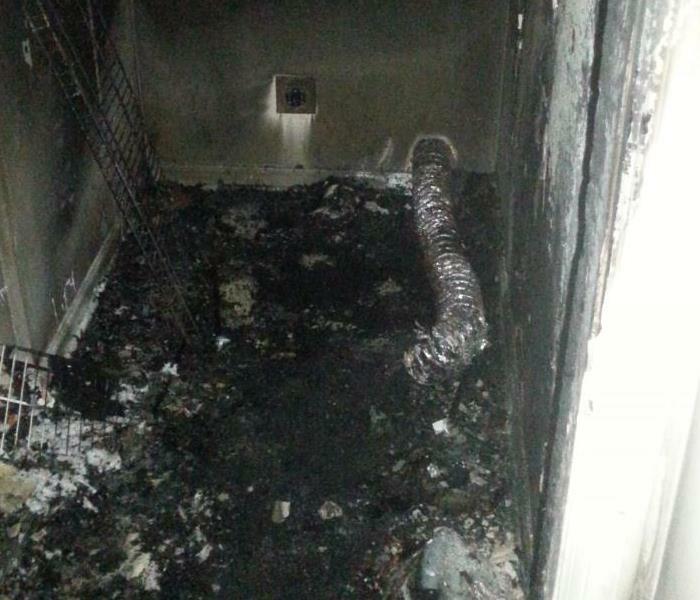 This is how much damage was done when a dryer caught fire while the home owners were home. We were on the scene as soon as the fire department released the structure.